At first blush, disparaging a heart-of-gold film like Adam is rather like pulling the wings off a butterfly. 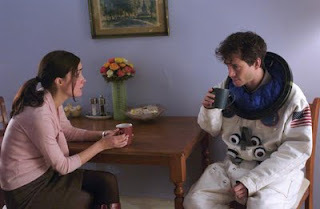 We first meet the eponymous Adam (Hugh Dancy) on the eve of his father’s funeral, leaving the young Asperger’s syndrome sufferer to live alone in his New York City apartment, a meager existence anchored by only his job as an electrical engineer for children’s toys. Enter Beth (Rose Byrne), the nice girl in a strange town, who is drawn to her socially inept, high-functioning autistic neighbor from the moment he lets her borrow his laundry card and starts babbling obsessively about astronomy. The narrative use of mental illness works when it serves as a springboard for examining some larger cultural or symbolic significance, like One Flew Over the Cuckoo’s Nest. On the other hand, in a film like Rain Man, it is simply offensive when used as a gimmick to prop up an otherwise mundane plot. Adam was an award-winner at this year’s Sundance Film Festival, where writer-director Max Mayer claimed that that his narrative use of Asperger’s is a metaphor for “the tension between all us human beings […and] the desire to connect to one another.” However, it is never clear why Beth takes such a shine to Adam, and even as their relationship transitions from friendship to physical, her affections never feel much different than those normally afforded an abandoned child. Beth is perfectly willing to enjoy the charming, childlike qualities of Adam’s condition, but she runs for the hills the (unrealistically few) times he throws a temper tantrum or manifests some other unpleasant side effect. Ultimately, Beth acts more as Adam’s social guide dog, steering him toward so-called proper behavior until she discerns it’s time to release her pet-project back into the wild. Backed by mawkish musical cues, Mayer treats Adam’s idiosyncrasies like a curiosity servicing a humdrum storyline that also aimlessly sidetracks through the legal travails of Beth’s white-collar father (Peter Gallagher). “I’m not Forrest Gump, you know,” deadpans Adam when Beth gifts him a box of chocolates. Unfortunately, Adam is a pedestrian film in which, protagonist’s eccentricities aside, you pretty much know what you’re going to get.